Essential knowledge on health care is rather limited for many women living in the slums of Buenos Aires. 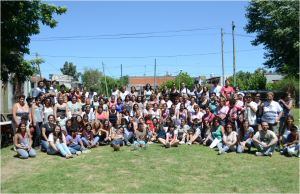 Laura Dadomo set up this project, to ensure that 100 women, living in the slums of Buenos Aires got training on various health related topics like nutrition, pregnancy risks, child health care & family planning. Besides these workshops, some women will also receive a medical examination, with a pap test, electrocardiogram, and breast scanning. Implementation of this project was in collaboration with Mujeres 2000 an Argentinian NGO supporting entrepreneurial women with micro-finance and workshops. The project would not have been possible without the voluntary help of many medical doctors, who helped to design booklets and prepare and give the workshops.